Santa Maria style tri-tip recipe perfect for grilling during barbecue season! A smoky, sweet and spicy rub adds instant flavor to this tender cut of beef. When Jason and I attended college at CalPoly, San Luis Obispo, we quickly learned that one of the culinary delights on the Central Coast of California was the famous beef tri-tip cut. Downtown San Luis Obispo has numerous restaurants like Firestone Grill that offer the seasoned hunks of meat on their menus, often thinly sliced and served on a soft French roll and drenched in BBQ sauce. Yum! Since graduating and migrating South over a decade ago, we haven’t had much opportunity to get some authentic Santa Maria style tri-tip as often as we would like. Many local BBQ restaurants fall short of the ones we had in San Luis Obispo. I’m sharing my tasty tips for making this flavorful beef right at home. Barbecued tri-tip is said to have originated from the Central Coast, where the workers on the ranches were given less tender cuts of meat that were thought to be flavorless. However, with the proper seasoning and cooking time, people realized that tri-tip could be prepared just as flavorful as the more expensive and desired cuts of meat. The area of Santa Maria, California has now become known for this kind of barbecue delight, and visitors to this beautiful coastline make sure to grab some tri-tip during their visits. Sometimes it helps to have friends in the right places, Jason’s friend Mike happens to live in Santa Maria, and he helped recommend a few cooking tips. I wanted to infuse extra flavor in the crust of the tri-tip meat, so I created a smoky, sweet and spicy rub for my Santa Maria style tri-tip recipe. 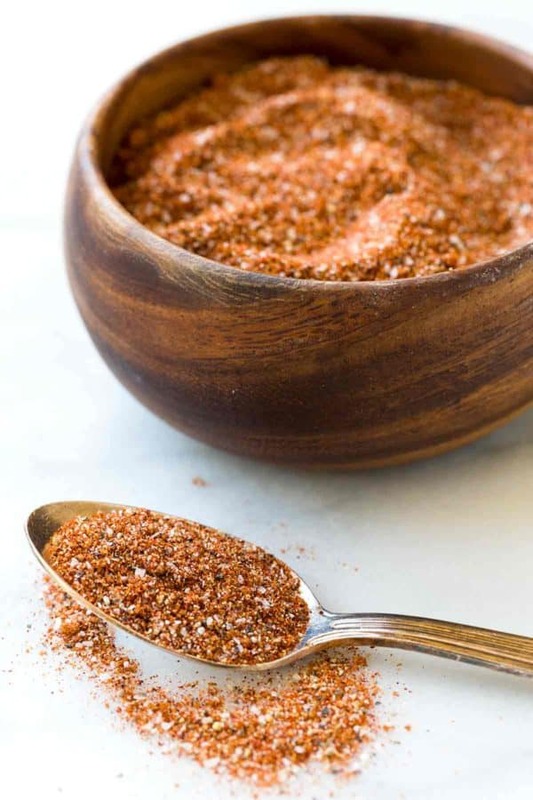 Spice Rub: A blend of paprika, chili powder, cayenne pepper, cumin, sugar, garlic, onion, salt, and pepper to create a nice balance of flavors for the rub. Allow the meat to marinate in the seasonings for at least 3 hours, up to 3 days for the flavors to penetrate the surface better. Grilling Tri-Tip: For large roasts, I like to rest the meat at room temperature for about 1 hour before cooking. This technique allows the meat to sear nicely on the surface without taking too much time for the meat to cook on the inside. The high heat from the grill and sugars in the rub create a beautiful crust when seared for 10 minutes on both sides. This cut is pretty thick, so to nail the right doneness of the meat the heat is turned down, and grill is covered to roast the beef. Use an instant-read thermometer to check the internal temperature, 120-125°F (medium-rare) and 130-135°F (medium). Resting: Carryover cooking occurs with meat, so that is why you stop cooking before you hit the desired internal doneness temperature to account for the off-heat cooking that continues to happen. For a 2 to 3-pound tri-tip roast, 15 minutes is a good resting time. Cutting: When slicing tri-tip, it’s easy to see the direction that the grain runs along the muscle fibers. If you’re looking at the beef with the thinner end pointing towards you, the grain runs parallel from the short sides. Make sure to slice against the grain, with the knife at a slight angle, so you don’t end up with extremely chewy slices of beef. If you haven’t had tri-tip before, this is a flavorful recipe that doesn’t require a long cooking time and can be prepared days ahead so that you can enjoy within an hour or less of grilling! Tri-tip is a cut from the very bottom of the sirloin section of the cow, between the ribs and rump, shaped similarly to a long triangle. Due to this shape, you will get some thinner parts of the cut that will cook more quickly than the thicker sections. This is great if you have eaters who like more well-done pieces, or like me, who prefer medium-rare, you get the best of both worlds! This Santa Maria style tri-tip is fantastic with a delicious BBQ sauce. I serve mine with my homemade sweet and spicy barbecue sauce. Once you give this steak a try, it will often be requested by friends and family at your summertime gatherings! Have you made tri-tip before? I would love to hear about your experience in the comments section. Happy grilling! Why is it important to “rest” meat before slicing? Combine all dry rub ingredients in a small container and set aside. Trim the silver skin and fat layer from the trip tip. Place the tri-tip on a sheet of plastic wrap. 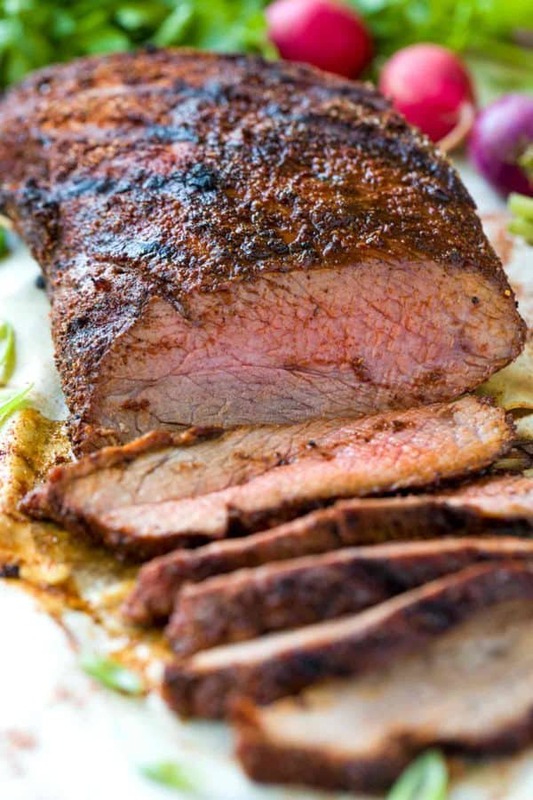 Generously coat the tri-tip with about 4 tablespoons of dry rub, 2 tablespoons on each side. Store extra dry rub in an airtight container for later use. Tightly wrap the seasoned tri-tip and refrigerate until ready to use. Allow the rub to settle into the meat for at least 3 hours up to 3 days. When ready to grill, remove the seasoned tri-tip from the refrigerator and allow to come to room temperature, about 1 hour. Clean grill and lightly oil using a paper towel dipped in vegetable oil. Heat the grill to medium-high if using a gas grill. Once grill is very hot, place the meat on the grill, searing one side for 10 minutes with the lid open. Turn tri-tip over and sear for another 10 minutes. Turn heat down to medium and close the lid. Allow the meat to cook for about 15-25 minutes, checking temperature until the thickest part of the meat reaches 120-125°F (medium rare), 130-135°F (medium doneness). The meat will continue to cook after being removed from the heat, so stop cooking at a temperature a few degrees lower than the desired doneness. Remove the tri-tip from the grill and allow to rest wrapped loosely in foil for at least 15 minutes before slicing. The foil will catch any juices from the meat, which can be added back to the meat after slicing for more flavor. Thinly slice the tri-tip against the grain. Serve with your favorite BBQ sauce or on a French roll. Have you considered drizzling some olive Oil over it after you rubbed the spice in? I have come to enjoy doing this with my meats, sometimes trading out for WORCESTERSHIRE sauce (or even blending both). Helps tenderize the meat more and adds more flavor. Just remember to watch it on the grill for the first few minutes — stepdad would burn the meat the first few times until he finally remembered the oil. But we love tri tip even more with that drizzle. Definitely think Ill enjoy this rub tonight though (and of course, added that drizzle). Just made and threw in fridge to settle for a bit. That’s a great idea! Infuse some of those spices into the meat even more with the oil. I hope you enjoyed the recipe! Hi Jen- Happy anniversary! I hope you have a wonderful day celebrating and enjoy the recipe, cheers! Hi Tim- You are making me hungry! I wish I lived a little closer to SLO so I could get my fix of firestone and all of the other yummy restaurants. My husband is a big tri tip fan, and I would often order the ABC burger with those yummy fries of course! The seasoning taste a little like Tony Chachere creole seasoning, how you ever tried it? Super good on meat too. I really like your method, super tender with the slow roast and that sear to add flavor and texture at the end sounds amazing! Unfortunately I moved away from home (CA) and then discovered tri tip is a west coast cut. I FINALLY found a nice tri tip at a local grocery store and went searching for marinade / rub ideas. We tried yours last night; DH and I actually high fived after we both took out first bites! Amazing rub on a fantastic cut of meat! Can’t wait to find another tri tip so we can grill it again just like this. Thanks for sharing it!! Found this on Pinterest thank you! I lived in slo for 6 months as a nanny 10 years ago. Man I feel old! I miss Firestone so much, and everything about slo. Thanks I’m making this today! how to cook tri tip in oven? Hi Jay! Give this method a try: Prepare meat with rub as instructed. Heat oven to 350 degrees F. Add 2 tablespoons of olive oil or other cooking oil to a large, heavy ovenproof pan. On stovetop, heat on high until pan is very hot, then add tri-tip, fat side down. Turn heat to medium-high and sear roast for about 4 minutes. Turn the roast and put it in the oven. Cook it for about 10 minutes a pound, checking with an instant-read thermometer until it reaches 130 degrees for medium-rare. You can sear the meat in a pan then transfer to a sheet pan and then roast if your pan isn’t oven proof. Let me know how it goes! My husband is from Santa Maria and we definitely love tri tip! Glad to see you sharing it with those that don’t know yet!! 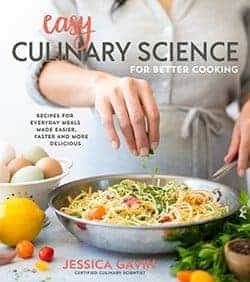 I can’t find the recipe! Another dish that was out of this world delish! Summer in our home is way too hot – I can’t even think about turning on the oven so we grill all the time. I surprised Ryan with a little surf and turf on a Friday night. I served the tri tip topped with chimichurri and grilled shrimp. The best tri tip EVER! The entire family loves, loves, loves this and are already begging me to make it again! Whoo hoo! So happy to hear that everyone enjoyed the tri tip and wants round two Claudia! I cooked this for my family tonight, and my family loved it. 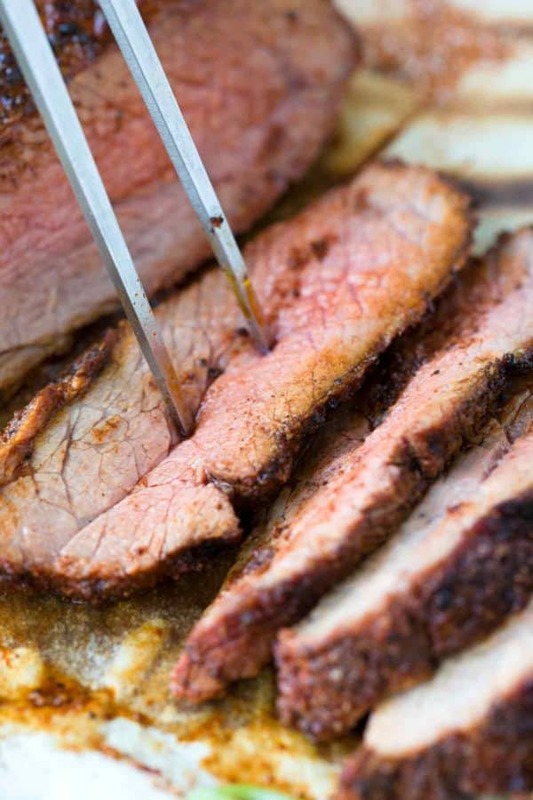 Thank you so much for sharing this great Tri-Tip recipe, along with the spicy barbecue sauce. Yay Tom! That is fantastic that your family loved the recipe, that’s my goal 🙂 The sauce is definitely the cherry on top! Thank you for giving it a try, cheers! Thank you for the delicious recipe! Do you know how long the rub will be last in an airtight container? Thank you for your feedback Mona! So happy to hear you enjoyed the tri-tip! You are absolutely correct. Garlic powder and black pepper pepper are all the spices you need for Santa Maria tri-tip. Dried parsley is a plus The use of cooking over RED Oak is the one thing that none of these recipes can replicate. They could not cut the beef like that, here, now we can get tri tip. It has gotten so expensive. We don’t have it as often. My husband and my son, both graduated from Cal Poly. I love San Luis Obispo. You are so lucky Karen! Yes, tri-tip seems to be quite the delicacy nowadays. I love that your husband and son both attended Calpoly. What did they study? I’m hoping my son will go there someday so we can visit often 🙂 I love SLO too! NOT true SM style at all. As someone mentioned, salt, pepper and garlic salt or powder. Grilled over red oak. Served only with salsa, not with bbq sauce. In TX we can’t get the oak, and only recently found tri tip. I grew up in Orcutt/Santa Maria. Also have to have Pinquitos, or at least pintos cooked Jockos style! I’ve been cooking a lot of years and I have to tell you this is the BEST rub I’ve ever made! Thanks! I do not eat spicy. If I did not put in the chili powder, its taste would still be delicious? About to try this rub for the first time with a slight tweak to the recipe. I substituted one of the two TBS of paprika for smoked paprika to give the meat a little more smoke flavor. I also have a charcoal grill, so I’ll be adding some hickory chips to the coals. I can’t wait to taste it. I’m trying this today…trying to knock my Qin’ up a notch. Maybe I’ll try the plain s/p garlic powder version another week. Unfortunately, our local supermarket has decided it’s pretty funny to pack the tri-tip with a huge hunk of fat underneath. I wound up with only 1/2 the meat and am not sure it will be enough for our family. My boyfriend and I tried this recipe and it’s EXCELLENT!! This gave me a boost of confidence on the grill. (I’m generally not good at it.) I just stumbled upon your site and read your bio. Very interesting. So excited to try your other recipes. Thanks, Jessica. How would I grill this with briquettes? Hi Marja- Great question! I would prepare the briquettes how you would normallu, creating a medium-high heat environment. You can cook the first side for 10 minutes uncovered, and then flip to the other side and cook covered for 7 to 10 minutes. I would use a thermometer to monitor the internal temperature for doneness. Hi Marja- Great question! I would prepare the briquettes how you would normally, creating a medium-high heat environment. You can cook the first side for 10 minutes uncovered, and then flip to the other side and cook covered for 7 to 10 minutes. I would use a thermometer to monitor the internal temperature for doneness. Made mine with Chipotle powder instead of Cayenne and added olive oil and a touch of red wine vinegar to make a paste, tasted amazing raw. About to fire up the grill. Came out amazing! Recipe is a keeper! Jessica – we just stumbled on your very comprehensive article on your preparation of a tri tip. 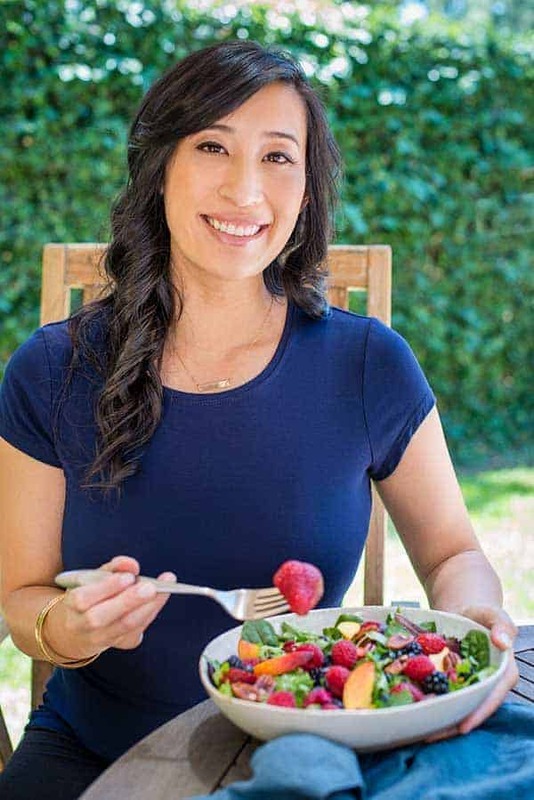 It’s wonderful to see other foodies from California’s Central Coast expanding on our local culinary traditions. If you’d ever like some locally-grown Pinquito Beans to experiment with, just drop us a line! How would you make a tender medium rare try tip, on a charcoal grill? Great question Halen! I would set up the charcoal grill by putting the lit charcoal onto one side of the grill, this way you have zone to do indirect grilling. I would sear the steaks for 10 minutes on each side with lid closed and then transfer to the indirect heat zone with the lid closed, cooking until the meat reaches a medium-rare doneness, about 125-130 degrees F. Let the meat rest for at least 10 minutes before you slice. I followed your instructions, but the roast caught fire and charred to a crisp black hue. 🙁 Where did I go wrong? Hi Trilby- Can you tell me about your cooking process? Did you use a gas or charcoal grill? Did you grill the first side with the lid open? There is some sugar in the spice rub, so it will char a little but shouldn’t catch fire. How did you add the oil to the grill? Tri tip is almost unheard of in Sydney. Found one the other day so thought I would give it a go. Used your recipe and it turned out fabulous. Was using a basic char grill bbq (no hood). It was very hot so necessary to turn a couple of times rather than just the once. Then finished it off in the oven. Will definitely be doing it again. Hate to admit it, but American bbq is way ahead of what we mostly do here in Oz. I don’t know where you ate, but this is NOT Santa Maria style! Far Western, The Hitching Post, AJ Spurs, Jockos, McClintocks, they all cook it that way. I ought to know; I grew up there, spent 40 plus years on the coast. Santa Maria style is simply salt, pepper and California style garlic seasoning the meat which is then grilled over red oak. Anything else is just tri tip! A proper Santa Maria Tri-tip Barbeque includes tri tip, pinquito beans, green salad, salsa, garlic bread and macaroni & cheese – according to the Santa Maria Historical Society. The term is even copyrighted!!! My family is from Santa Maria and my grandfather belonged to the exclusive and selective Santa Maria Barbeque Club which hosted huge community barbeques on Sundays from April to October. He was very rigid about the recipe! I really love this comment Sam, so much helpful info! That is so incredible that your grandfather was in the elite BBQ club! I definitely need to serve the tri-tip with the sides you suggested. Thank you! Yes, sweet paprika, but I do love a little-smoked paprika to boost the smokey flavor! I loved this recipe. The rub flavorful, the meat is tender. My requirements for a good roast are met. As a Santa Maria native, true tri tip is served with fresh salsa, not bbq sauce. The flavor of bbq sauce just ruins the true flavor of the meat!